The following Links will take you off our OMD site to our FULL VERSION CATALOGS. Unbelievable choices at incredible prices! Easy search button to find exactly what you want! Simply hit the "request a quote" button and we will respond immediately with a price. We also work with companies like Charles River, Holloway, Carhartt, Otto Cap and others if you would like pricing on a particular style, brand or item. Just email us and we will be happy to help you! Tri Mountain Apparel is our newest addition to OMD! Amazing garments, unique and different. You'll love it! Check it out. Port Authority is the main brand in this catalog, however you will find Corner stone, District Threads, New Era, Nike Golf. Ogio. Sport-Tek, Eddie Bauer and much more! 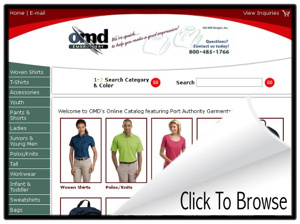 Quality and affordability all in one simple website! Check it out. 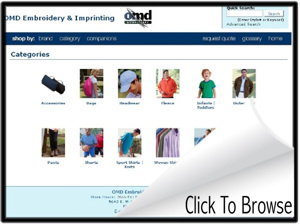 In this catalog you will find your general brands, such as Gildan, Hanes, Jerzees along with some private label brands such as Chestnut Hill, Devon & Jones, Liberty and much more. Check it out!